This tart dough handles and rolls beautifully, and once it's baked, is strong enough to hold itself and whatever you fill it with without the aid of a pan. But the most amazing thing about this dough is the flavor: the citrus zest adds a touch of panache to any tart you make with it without overwhelming the filling. We recommend freezing whatever you don't use right away; the dough will keep for 3 to 4 months, well wrapped. 20 mins. to 20 mins. To make the dough: Combine the sugar and zests in a medium-sized mixing bowl, and stir to combine. Add the flour and salt, and whisk until well-combined. 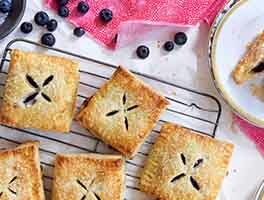 Cut the butter into small chunks, and cut these into the dry ingredients; mix until the dough has a texture similar to rolled oats. Add the egg and egg yolks, mix for another 2 minutes, then add the water, and mix 2 minutes more. Take the dough out of the bowl, and use the heel of your hand to smear the dough on the surface until it comes together in small pieces. Press the pieces together. If necessary, sprinkle it with more water or flour to get a smooth consistency. Divide the dough into three pieces, forming each into a 4" disk. Wrap the disks, and refrigerate them for at least an hour before rolling. To form and bake the dough: Take one piece of dough out of the fridge, allow it to soften for about 5 to 10 minutes, until it's pliable, and roll it out to fit a 9" square (or 10" round) tart tin, preferably one with a removable bottom. If you don't have a tart tin, use a 9" pie pan. 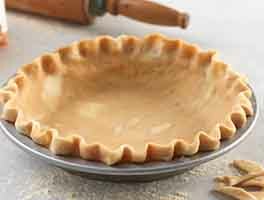 Prick the dough all over with a fork; fill it with pie weights or a pie chain; or line it with waxed paper, and fill it about half full with dried rice or beans. Chill the dough again before baking, if possible. Bake the tart shell until the edges are golden, about 14 minutes. Remove the weights and return to the oven. Bake for 5 to 7 minutes, or until the bottom of the dough is set through and a light golden brown. Pay attention while you mix the butter into the dry ingredients, or you'll have little islands of butter in your dough that will create holes when baked. 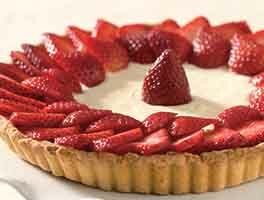 This was beautiful dough and made the best small tart crusts for me. It was so easy to work with too. I added 1 tsp. lemon extract. Love this recipe. I used homemade candied lemon and orange peel and the microwave lemon curd topped with fresh blueberries. The leftover dough makes a great refrigerator cookie. I've made this several times, and it's always excellent. It really does smell good, too! 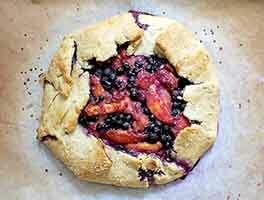 This is my go-to dough for French-style fruit tarts. I use another KAF tip and shred the butter in the food processor, then cut in the shreds. (I still occasionally get tiny holes in the dough, but they're easy to patch.) This recipe makes a lot of dough, and it freezes well.